Just a friendly reminder that the two player co-op Gunstar Heroes hits the Xbox Live Arcade today for 400 . The game will launch on the PlayStation Network tomorrow. 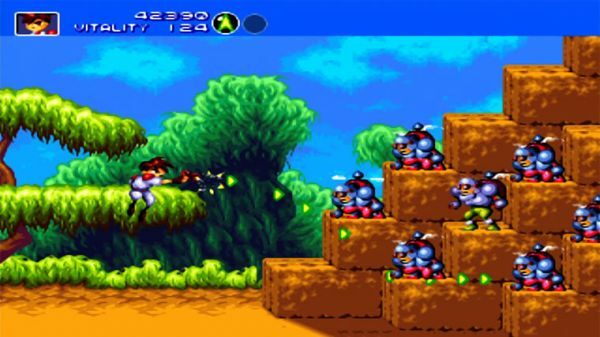 Gunstar Heroes features enhanced graphics as well as online and local co-op play. Gunstar Heroes is a classic Sega Genesis title which is similar in nature to games like Contra, but has one major difference - a health meter. This puts less stress on avoiding bullets and allows players to focus on taking out the bad guys. You'll also be able to improve your character and save your progress as you go. If you are looking for some Microsoft Points to purchase this title, why not pick up some instant codes from Amazon and support Co-Optimus? You can add the game to your 360 Download Queue right here. Page created in 0.3200 seconds.